Chief guest at the 40th Observer/Mobitel Schoolboy Cricketer of the Year awards night Ranjan Madugalle promised that he is prepared to attend the 50th awards night of this prestigious function even travelling on a turbo-charged wheel chair. Madugalle who was the first recipient of this contest in 1979 when he won the Schoolboy Cricketer award as the captain of Royal College recalled nostalgic moments during his speech that was well received by the packed audience at the Colombo Hilton Hotel on Tuesday. The most prestigious Sunday Observer-Mobitel Schoolboy Cricket Awards show will be aired on ITN television today (July 8) at 10.00 pm. The awards ceremony was held on July 3 at the Hilton Hotel in Colombo where Trinity College player Hasitha Boyagoda won the main award that was presented by former Sri Lanka captain Ranjan Madugalle. 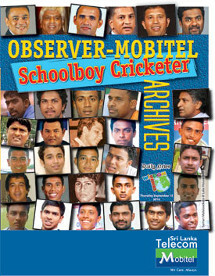 40th Observer - Mobitel Schoolboy Cricketer Awards Ceremony will be held today at the Hilton Colombo Main Ballroom. Chief ICC Match Referee Ranjan Madugalle will be the Chief Guest. History will be repeated when the grand finale of the 40th Observer-Mobitel Schoolboy Cricketer of the Year contest will be held at the Grand Ballroom of Colombo Hilton on Tuesday, July 3. The first-ever recipient of the Observer Schoolboy Cricketer of the Year title at the inaugural show held exactly four decades ago, will add colour to this historic occasion as the chief guest. He is none other than the Chief Match Referee of the International Cricket Council (ICC), Ranjan Madugalle. St. Peter’s College all-rounder Sachin Silva will be one of the stars to pick up his trophy at the Sunday Observer Mobitel Schoolboy Cricketer of the Year Awards ceremony which will be held on Tuesday July 3 at the Hilton Hotel in Colombo. Silva may not be able to boast of anything stunningly spectacular or scientific on the field of play but he polled nearly 40,000 votes and was a clear winner when the voting ended last week for the Sunday Observer Most Popular Schoolboy Cricketer of the Year contest. Two Observer-Mobitel Schoolboy Cricketers of the Year main title winners -Kusal Mendis and Dinesh Chandimal, have shown impressive form in the first two Tests against the West Indies during the Sri Lanka team’s current tour of the Caribbean. Mendis, who won the Observer-Mobitel Schoolboy Cricketer of the Year title in 2013 as the then captain of the Prince of Wales College, Moratuwa, is the leading run-getter for Sri Lanka in the ongoing three-Test series against the West Indies. He has aggregated 238 runs after the first two Tests with a century and a fifty. Former Secretary of the Sri Lanka Schools Cricket Association (SLSCA), B.S. Perera said more schoolboy cricketers are stepping into the Test arena now, than in the past, but only a few have been able to cement their places. Comparing the golden era of Sri Lanka’s school cricket – 1979 to 1991, during which legendary Sri Lanka cricketers in the caliber of Ranjan Madugalle, Arjuna Ranatunga, Roshan Mahanama, Asanka Gurusinha, Aravinda de Silva, Sanath Jayasuriya, Muttiah Muralitharan, Marvan Atapattu, Kumara Dharmasena, Chaminda Vaas, to name a few, to present day school cricket, the veteran school cricket official said a greater number of schoolboy cricketers are being produced at present although most of them have failed to retain their places. The Observer-Mobitel Schoolboy Cricketer of the Year contest, over the past four decades, has turned out to be an integral part of Sri Lanka’s school cricket, considered to be one of the best in the world. Since its inception way back in 1979, the country’s first and the foremost school cricket awards show has turned out to be one of the most sought-after events in local sports calendar. That is mainly due to the fact that the Mega Show has produced some of the legendary cricketers who have played for Sri Lanka with distinction.